Other Pieces of Me: Well, Lay Me Down and Call Me Edna! Both the hubs and I are working from home today. We are both sick as dogs so thankfully, Little G is at daycare. I was upstairs when the mailman came, so my husband brought up the mail. Tucked away in between a Land of Nod catalogue and a West Elm was a catalog for old lady clothes. Dear universe - I know I am no where near as stylish as this fun mommy blogger; nor as sassy as this lady. But do I really deserve the old lady catalog just yet? 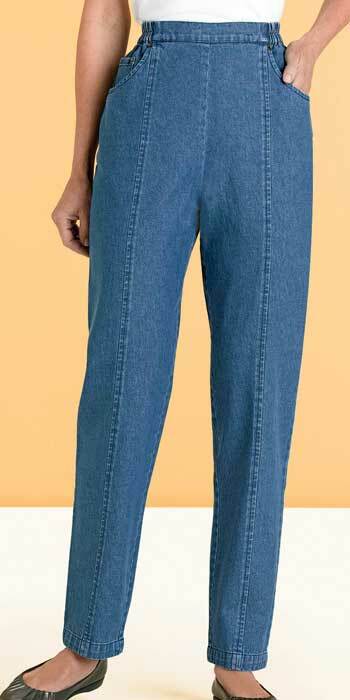 I know I love jeans that sit at the waist...but do I need acid wash, elastic waistbands and front stitching as well? I know I would prefer to stay in my jammies...but do I really need a lounger? I know I had hangnails on my toes that were 1000% more painful than giving birth to a 10 lb baby naturally...but can't I wait on the ortho-shoes for just a few more years? Please, oh please, tell me I have time?! Oh wait...the front of the catalog is proclaiming that someone else can get free shipping and handling with a minimum purchase. Someone else who lives two blocks over. Ok...back to my canasta game. HA HA HA!!! That was adorable my friend. I'd wear those jeans tomorrow if I had that waist!